Ever bought a set of those cheap Chinese-made multimeter probes? They probably had some little plastic inserts in the banana plugs. 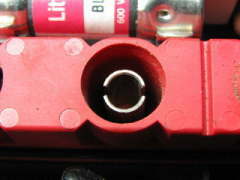 For what reason I’m not sure, maybe to keep the safety shroud around the plug from deforming. Don’t toss them in the trash. Instead toss the probes in the trash (they’re not that great) and keep the inserts, because you can fix the broken inner jack shrouds on your $300 Fluke DMM with them! Tektronix may be known best for their industry-leading oscilloscopes, but they also sell other test equipment, including a line of handheld multimeters in the 1990s. The model documented here is a DMM912, part of a series of multimeters that included the 912, 914, and 916. All are RMS-responding, 4000/40,000-count models with a number of premium features like min/max/average, auto-hold, peak-hold, AC+DC, lead warning, and memory storage. The display updates 4/sec in 4000-count mode or 1/sec in 40,000-count mode. Accuracy and bandwidth increases with each model; this 912 is rated at 0.2% basic DC accuracy and a bandwidth of 1kHz. The 914 and 916 make use of a secondary numeric display for simultaneous ACV and Hz readings, the 912 does not.